This is a anthology of 15 fair tails rewritten for today's girls. The stories are retold with Girl Power!!! In this version Sleeping Beauty is a specialist on sleeping disorders, Rapunzel is a world-famous architect, The Little Mermaid is a advocate for peace between mer-people and humans, and all the other favorites are here to in their new jobs. The kids and I enjoyed the new versions of the old tales. The book focuses on building up girls instead of leaving them locked in a tower and a man coming long and rescuing them. 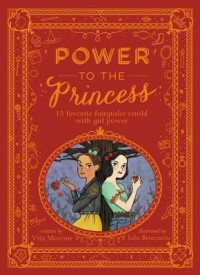 The new Princesses in this book seeks to help others, is open to learning new things, and looks for ways to add purpose to their lives and the lives of those around them. This book is written very well and teaches girls they can be and do anything.